Gal in the Middle: My, That's One Big Fork! The first time I saw the 25 foot sculpture - "God Bless America" - I was standing on a busy Chicago street last summer watching tourists crane their necks in wonder and snap photos as their children sat next to the giant shoes! I was one of those gawking tourists, though I only had my camera phone, snapping a shot of my eldest nephew in front of the statue! Here he is, doesn't he look excited...he just wanted ice cream. This shot was more to show how big the statue is and how it is truly street art in downtown Chicago! If you are not familiar with Grant Wood's famous painting "American Gothic," it is an iconic painting depicting rural America in the 1930s. While it is a look at our past, I also think this run-of-the-mill, hard-working couple also represents our present and future when it comes to agriculture. Pitchforks have been replaced by tractors, but the PEOPLE, families, are still raising the food we eat. To the tune of more than 90 percent of the farms in this country are family-owned and operated. The big difference is that those same family farmers are producing more food on less land so there are fewer farmers growing our food today. I'd like to say the farmers of today don't normally have this severe of looks on their faces. But as I look at the farm wife's expression, I have to say that I've seen that look from my own mother before (sorry Mom), usually when as a child I didn't do what I was told OR when as an adult I say something sarcastic that she doesn't appreciate! I'm excited to say that the "God Bless America" statue has made it's way to Indianapolis and is currently on display at the Indiana State Fairgrounds. I snuck in last week and took a few shots. As the Indiana State Fair opens this Friday and runs until August 22, I think the statue will be a focal point that fairgoers will flock to. If you visit, make sure you take a look at the pavers around the base of the statue. Each paver will have a fact about our state's agriculture - mixing a look at the past with where we are today. How cool is that! Ice cream production is defined as regular, low-fat and nonfat. For 2009, Indiana was the second highest producer of both regular and low-fat ice cream. Today's American farmer feeds about 155 people worldwide. In 1960, that number was 25.8. An acre of corn removes 8 tons of harmful greenhouse gas, more than that produced by your car. 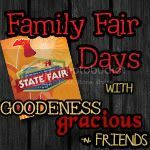 Remember, if you want a chance to win a Family 4 Pack of Indiana State Fair admission tickets courtesy of Indiana Soybean Alliance, follow my blog and go to my post earlier this week - Our State Fair is a Great State Fair...Ticket Giveaway! - and leave a comment. Or click on the button below for full details of the giveaway. Great plug for Ag with a little history worked in! Love it! I LOVE IT,I can't wait to take our son for a homeschool field trip.This will be so great to see. I am looking forward to seeing the happy couple. oh cool.. that IS huge!!! I wonder if it will make it's way to our state fair. What a great giveaway ~ although I would love to win it would be wasted on me since I wouldn't be able to get there. lol. Hi..I’m Barb…from TTA.. I am your newest follower. I hope you will get a chance to visit my blog @ santasgiftshoppe.blogspot.com & get inspired by something for your family/home. I hope you will take a peek and follow me as well. Nice to meet ya new friend!! !